I went out early on record store day to a pretty popular store on Long Island called Looney Tunes. I rarely get out there cause they're more than an hour away, but I thought it was worth the trip this time. I was looking for the Misfits repress of Walk Among Us. Unfortunately, they sold out before I got there. The dude even snickered a little when asked him if they still had copies. They said they had 10, but were gone within 5 minutes. One thing I didn't realize was that they opened an hour early for "VIP"s. To be a "VIP" you paid them $25 a year. To be honest, that's a little shady. I hate to speak ill of my fellow Long Islanders, especially when they've been around for so long, and so many people love them, but I don't know...paying to be important? Well anyway, when I got there the line was wrapped around the store. There were probably 50 people in line with vinyl in their hands. It was impressive. But as impressive as it was, I was still SOL on my Misfits endeavors. Luckily, a buddy of mine on twitter, Sean Powers, said he might have a line on a copy. He tweeted me a little while later and said he had a copy on hold for me. HEYO! Couldn't believe it. He grabbed it, shipped it out a few days later, and it arrived packaged beautifully in a nice sturdy box, with not just one stiffener, but two! Always nice to see a dude shipping things out with class and compassion. So let's take a look at it. So I received 3 surprises concerning this record. One was the record size. I actually was confused about how this was being pressed until the time I opened the box that Sean shipped me. On the Record Store Day site, they said this thing was a 7". Obviously I thought that was a mistake, but then Susannah's boyfriend Ben mentioned that maybe it was a triple 7". That made sense to me cause it was being pressed on 3 colors, and I never saw the pressing info. Turns out it was a standard LP. 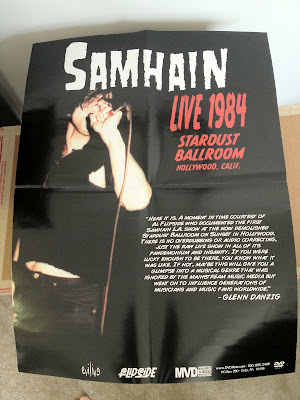 The next surprise was that it came with a really cool poster. I'm down with that. Strange that it came with a Samhain poster, when the release is Misfits. I wonder if this is just something Sean had, and just included cause he had no need for it. It's in great shape, so I assume it came with it. I didn't measure it but it looks like 18x24. The final surprise was the pressing info. Turns out this clear version is stupid rare. I didn't realize that. This thing is out of 500 and goes for dumb money on eBay. I definitely got lucky on this one. I owe Sean big time. UPDATE: Sean says those posters were there at the store and he just grabbed one figuring I'd like it. What a nice dude.